Raith manager Barry Smith (picture by Fife Photo Agency). 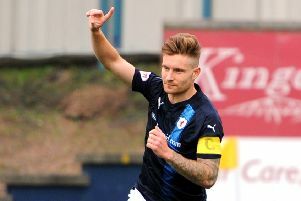 Barry Smith will take his Raith side into Saturday’s live TV clash with Hearts in a positive frame of mind. Despite the side’s surprise 2-0 defeat to Cowdenbeath in their opening Betfred Cup group game on Saturday, Smith says he knows his side is capable of much better and can put that loss right this weekend. He’s calling on them to go out and show what they’re truly capable of at Bayview in front of the BT Sport cameras. He said: “We’ll approach it positively. “You’ve got to keep focused on what we’re wanting to do. “We never got the result or the performance we wanted on Saturday, but I’ve got full belief in these players that if they are called upon again, then they will give as good an account of themselves as they can. “It’s a difficult game to play when you’re not at full strength, but we’ll go and test ourselves. “I wouldn’t mind half of Hearts’ players. I think they’ve got two squads, and play different squads for different games. Smith refused to use the amount of injuries his squad is having to cope with as an excuse for the Cowden defeat, saying the 11 put onto the park were still capable of winning the game. However, there’s no doubt that once Smith gets some of the players who are sitting in the stands back on the park, his side will be a different proposition. “You just get on with what’s in front of you,” said the manager. “It doesn’t make it any easier, it is difficult position to be in, but we fully believe once we get our strongest 14 or 15 players available, then we’ll have a very strong team. “The young ones, and no disrespect to them, it’s difficult putting them in and out of the team, but the good thing for them is they are getting a wee bit of experience at a young age. “We tried to play with a strong back four - they are all defenders, and we were just filling spaces with the other ones. And it’ll be a case of waiting for those players to return, with the manager unlikely to add to his squad much further. “That’s the squad,” said Smith. “Ideally we’d like a few more in, but that’s what it is, and we’ll work with that, on the basis that we believe we have a strong squad. “But when down to the bare bones it makes it more difficult.